In this follow-up to Bonk's Adventure, Bonk must again battle King Drool and save the moon and Princess Za, but this time in a land infested with Chikkuns, the egg shell-helmeted enemies. 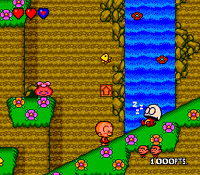 The game featured brighter and more cartoony graphics and sound, more in line with the comic strip, and greatly influences later Bonk games. Evil King Drool III, the grandson of King Drool, is out for Bonk! And he's building a Monster Kingdom that threatens to destroy the world. 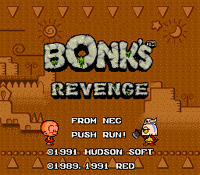 As Bonk the Caveman, you're out for revenge in this all-out head-banger of a follow-up to the original Bonk. Konock yourself out with all-new characters, bonus stages, power-up items and an array of enemies that may look "friendly," but certainly don't act like it!